Whether it’s accidental splatter on the window or a mason jar crafting misstep, here’s how to quickly remove paint and make any glass crystal clear again. You set out a drop cloth and meticulously lined the wall trim with painter’s tape, but you still ended up with a little bit of paint splatter on the windows in your kitchen. Even with careful preparation, you’ll have the occasional drip-drop during a project, but removing paint from glass is a lot easier than you think. In fact, it requires minimal tools (most of which you can find beneath your sink) and minimal time. Still, there’s an art to getting the job done, whether you want to remove the paint from your windows or from a mason jar paint project gone awry. Master the fix with this straightforward step-by-step. Fill a glass measuring cup or other dish with 1 cup of white vinegar, and bring it to a boil in the microwave. Then, wearing a pair of thick rubber gloves to protect your hands from the heat, dip an old rag into the liquid. Use the soaked rag and a little elbow grease to rub the paint spots you want to remove. The hot vinegar will help loosen the paint and often causes it to come right off in this first step. Don’t get discouraged if the paint remains, though; just proceed to Step 2. If vinegar doesn’t do the trick, it’s time to kick things up a notch. Fill the dish or bucket with warm water and dish soap (enough to make it sudsy), and dip your second cloth into this solution. Use it to thoroughly wet the paint spots on the glass. The soap you apply to the affected areas will act as a lubricant so you don’t accidentally scratch the glass. Now position a single razor blade (the sharper and newer the blade, the better) at a 45-degree angle from the windowpane. The angle here is very important: Any more or less, and you’re likely to scratch or break the glass. Push the blade in one slow, smooth motion to scrape the paint away. Always work in the same direction—never back and forth—as you carefully lift the paint off the glass. Basically, you want the paint to lift off all at once in one sheet rather than flake off the glass. Keep your damp and sudsy cloth nearby to moisten the paint anytime it appears to be drying out. 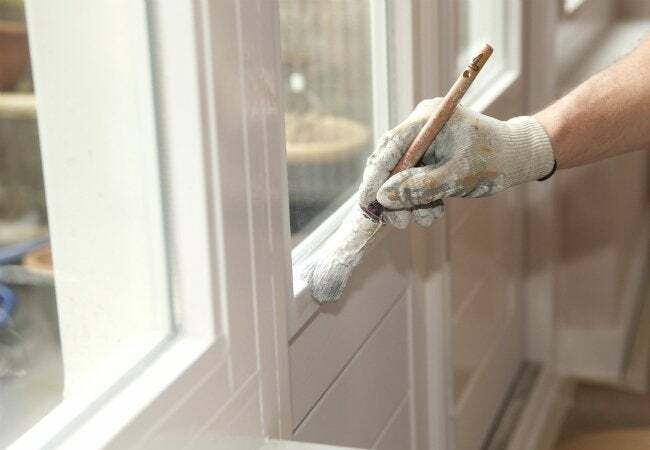 Once you’ve removed all the paint, grab a glass cleaner and spray down the windowpane wherever the paint used to be. Use another clean, dry cloth to buff out any streaks left behind so your paint-free pane will have zero obstructions on the next sunny day.